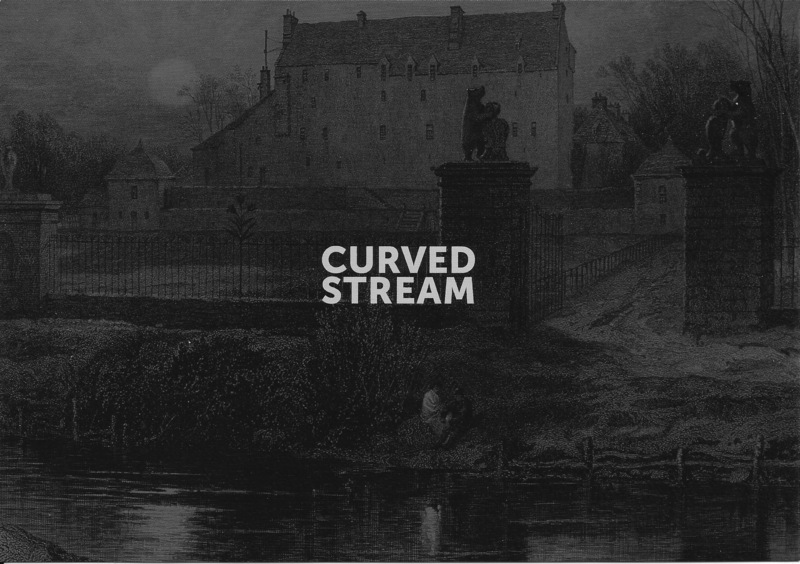 Curved Stream is an exhibition by seven artists and one writer (myself) at Traquair House, near Innerleithen in the Scottish Borders. Each of the artists has a work in one of the garden pavilions to the rear of the house, and a related work in the main house and / or in the gardens and grounds. 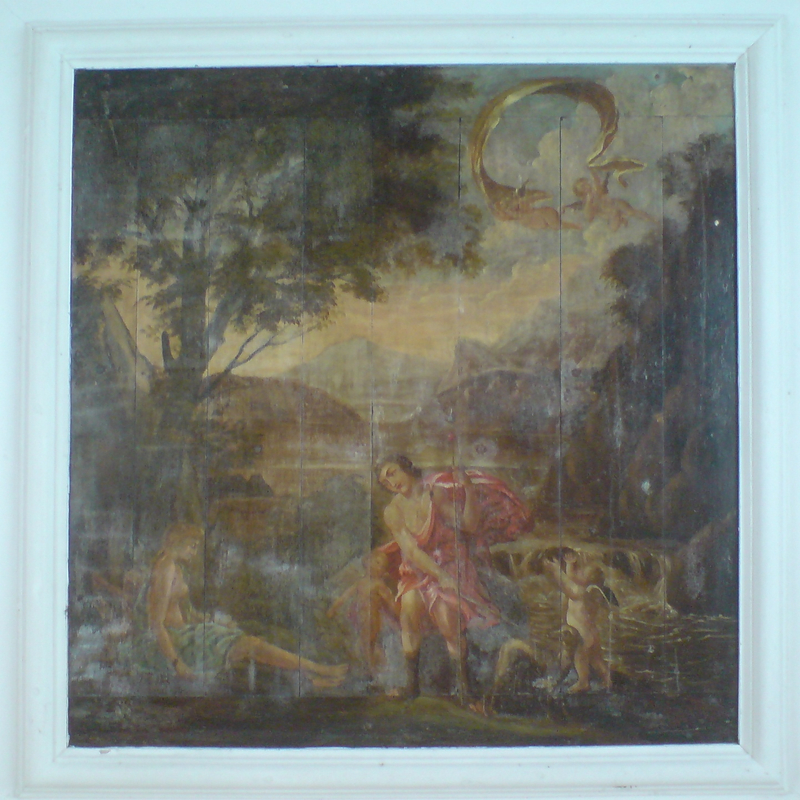 One of the pavilions has, as its centre-piece, an anonymous ceiling-painting depicting an episode in the story of Diana and Actaeon (told by Ovid in his Metamorphoses), just before the transformation of Actaeon into a stag. The survival, intact, of this beautiful artefact, embedded in the fabric of the building, exemplifies many of the special qualities of the site as a whole. The work I’ve made is called DEA SILVARUM (Goddess of the Woods), as Ovid describes Diana, and is a walk with poems on the theme of hunting in the gardens and grounds of Traquair House. The poems include Ted Hughes’ version of Ovid, plus works by Robert Burns, Edna St Vincent Millay and the great Anon, among others. I led a first walk at the exhibition opening on 5 September, and will lead a second on Saturday 10 October at 2.30pm. In the pavilion is a printed sheet listing the poems I selected for the walk, typeset by Barrie Tullett, with handwritten annotations featuring extracts from and reflections on the poems, as well as notes as to where I’d planned to read them. The sheet is in a drawer, so you have to open it to read the text – the idea for that was taken from a Victorian Game Book which was (but is not longer) on display in the house, in a glass below a window with a sheet of dark fabric draped over it to protect it from the light. I liked that ‘reveal’, and it seemed to echo the events in Actaeon’s story as well, so the text is hidden in the drawer, until its own ‘reveal’. The artists involved are Gordon Brennan, Mark Haddon, Jane Hyslop, Paul Keir, Deirdre Macleod, Andrew Mackenzie and Mary Morrison. There is more information about the exhibition and their work at the Curved Stream website and Facebook page.